My earliest memories of answering “What do you want to be when you grow up?” involved moving vehicles. Train Conductors were always getting off train cars just before they stopped or just after they started moving again, which I thought was so cool. The Garbage Man had such a great job: he hung off the back of the truck with one hand, then got to smash all that stuff into little bits by pulling on that little lever. I imagined Firefighters, especially those who held onto the back of the engine, were always having the greatest time on their rides. Memories of these dream jobs came back to me last week as I stood in the open doorway of a local bus in route 1 outside of Chiang Rai, Thailand. This green machine, perhaps 40 years old and at eight-fifths capacity, had no other sitting or standing room for passengers. I held onto the back of the seat in front of me with my right hand, the handle on the outside of the bus door with my left hand, and hugged the retracted according glass door, lashed open with bungee cords. I peeked my head out of doorway as we motored down the highway, taking in the unique and the ordinary along the side of the road. It was thrilling. My grandparents had an RV camping trailer that they used on their road trips (I love, by the way, that my grandparents, who were both born before 1920, crushed the #camplife meme two generations before Instagram made it hip). They parked the 30 foot trailer in their driveway, and I spent hours playing on the step outside one of the doors. There was a retractable metal step, which when extended into the locked step position, felt a lot like the moveable stairs that the Amtrak conductors unfurled when coming to a station. My grandfather also owned a conductors metal step stool, which was legendary by itself (his father had been an actual Union Pacific Conductor in Wyoming and Utah in the early 1900s). I had my routine for approaching the imaginary station set: I opened the door to the trailer, pulled the steel step out, and, holding onto the handle on the outside of the door frame, leaned away from my train car and towards the platform in that iconic conductor pose. I practiced grabbing the step stool from inside and smoothly putting it into position below the step on the ground. After my imaginary passengers boarded, I gave an “all aboard” call and reversed the process. These memories were visceral — a few minutes standing in the open doorway of an old bus and I was right back in that driveway. Last week, I saw cave drawings that are 14,000 years old. This is the Tarascon Basin in southern France, not so far from the border with Spain. 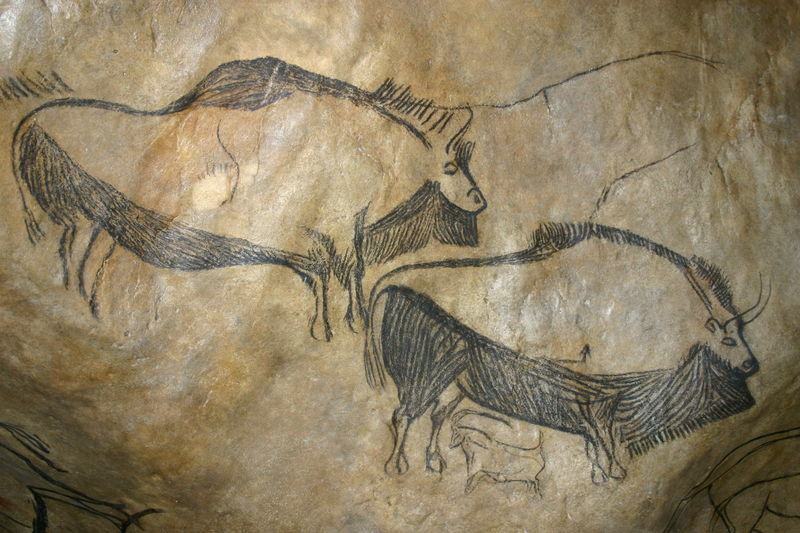 Bison, ibex, horses, and cave lion images on the gallery walls in the Niaux Caves offer an alternate experience to the typical French gallery visit one might expect in a country with so many art displays. Seeing these cave paintings was nothing short of thrilling. These are the oldest forms of human art or writing I’ve ever laid my eyes on, and the place where they occur is spectacular — these figures appear more than 800 meters from the entrance to a cave network that’s more that 2 kilometers in length; the darkness in the deep subterranean caverns is darker than pitch black. These ancient and anonymous artists did not live in these caves; they walked, with torches as their light source, all the way into this particular place to create, to pay homage to these animals. I’m pumped about the backstory here: the bison, the ibex, and the horse were all common animals in Europe 14,000 years ago, but not in the caves, mountains or valleys in this part of what’s called France today. The animals resided in the plains, which are relatively far from this narrow valley. These folks would have been semi-nomadic, which means that they were likely in contact with these species in flat-lands at some part of the year, then they retreated to this area for a different time of year. While they resided in huts or tents that were easily constructed, they plunged deep into this cave network to create this art. Of course, this means they had to find this cave network, explore it, then decide that this chamber was the place for their masterpieces. I love imagining what they must have been thinking when they decided that this was the place. The drawings are made from charcoal, which means the organic matter can be carbon tested — that’s how experts know that most of the drawings are 14,000 years old (there’s another set of drawings that were created 1,000 years later). The images are literal, not abstract, but show a sophisticated range of stylistic techniques. For example, natural contours of the rock were used to give some of the bison two-dimensional features, and in other places the horns of some of the animals are stylized in a wispy sort of way; additionally, some of the bison images are layered on top of each other. There is no abstraction and little change in the portrayal of the bison from 14,000 years ago and the bison drawn 13,000 years ago. Thinking of the art that we bring home to our parents to put on the refrigerator when we’re kids, I wonder what these artists’ mothers thought of this display. They must have been proud. I used to teach ancient history to 9th graders. My class content included examining some of the reasons for the Neolithic Revolution, the time when humans transitioned from nomadic lifestyles to living in settled communities. The catalyst for this event — perhaps the biggest shift in human history — was development of technology that enabled humans to control the environment and create permanent living spaces. There are a couple of theories for what caused humans to settle down where they did. The most common theory is that humans settled in places where they could consistently create agricultural harvests. Examples abound: settlements in the Nile River Valley, the Yangtze River, Mesopotamia. There’s another theory that has fewer advocates, but is intriguing; humans settled in places where it was easiest to have access to the materials needed to express their beliefs of the afterlife. In other words, they lived in places that made it easier to worship. I first read about this theory in this Smithsonian article about the village in Catalhoyuk, modern-day Turkey. In the mountainous part of southern France, villages, hamlets, towns, and small cities spread through the valleys, and are perched on top of craggy hillsides. The Pyrenees Mountains begin in earnest very close to here, and these population centers have long histories as basecamps for people who were preparing to cross the mountains. Human settlements in this area might be small in size, but they too have a long history, and perhaps it should not be a surprise that the earliest denizens of this region left behind artistic expressions of their lives. Clearly, the bison and ibex (the most common subjects) were important to these people. The images they look just like the animals they represent. I take this to mean that the observers knew their subjects well. Think about this: the ideas and the technique to depict them were so strong that the artists held them in their minds all the way from the plains to this mountain region, and all the way into the deep darkness of this cave network. Maybe it should not be a surprise, yet I stood there in amazement — at the articulation of the figures, by the location, by the age of the drawings. In the week that has passed, I’ve been into six medieval churches (and stood outside five others), all of which commanded devotion and inspired belief with the size and grandeur of the building. The architects intended on impressing those who walked in the doors of these enormous piles of stone, brick, mortar, wood, and glass. To the casual tourist and even the non-believer of today, walking into the holy sanctuaries of the Fourteenth and Fifteenth centuries provokes a deep breath at least, and often something closer to awe. The architects of the medieval churches designed structures to honor what they believed was the most important element in their lives. Their ancient ancestors knew something similar: that the animals of the plains were so critical to their existence that they were the only thing drawn on these dark walls, so deep in the ground, so far from the lands where the animals roamed. I saw this with my eyes, and I still have a hard time imagining their thinking. One of the calmest spots I can remember visiting is in Amritsar, India. Finding calm anywhere might be a challenge, even more so in India. Whether you visit or live in this country, one common experience is the unrelenting assault on the senses — the smells are too strong, the colors are so bright, it’s always hotter or colder than it feels like it should be, everything tastes stronger than expected. In my experience, coping with the sensory overload is key to figuring out how to live here because it is unrelenting. Getting on the right side of that makes India enjoyable; not figuring it out results in torment. Occasionally, a calm emerges on its own that is completely surprising. I have had two of these surprises so far in 2018. The first came while hiking to the top of a 500 year old fortress near Pondicherry, where, along the hike, a gateway along the mountain path provided some shade from the sun, and just the right amount of distance from the town and road in the valley that the only sound was the deafening ringing of silence in a very gentle breeze. The calm threw me — it was the quietest experience I’d had in India. The second moment of true calm I felt came sitting in the inner courtyard at the Golden Temple, in Amritsar, India. I wanted to visit Amritsar almost the moment I first heard someone describe it, but it is not easy to get to from Chennai. Transportation there and back is inconvenient, and a visit doesn’t quite fit into a long weekend. Amritsar is in the state of Punjab, far in the north of the country; Punjab was once a larger semi-autonomous region but was split in two when Pakistan was formed during the 1947 Partition. About a million people live in the city, most of whom are Sikhs. For Sikhs, this city is home to one of the holiest shrines: the Golden Temple. Amritsar feels like it’s a long way from Chennai. It’s a smaller city than Chennai is, and it feels grittier, more dense, like a mountain town where streets are narrower and people feel somehow closer to one other. In the oldest part of the city, streets are so narrow that it feels like they were intended only for walking, yet all kinds of two and three wheel vehicles run the gauntlets. In my brief introduction to the city, fewer denizens spoke English as in Chennai. Like every Indian city I’ve visited, colors explode. The saris women wear throughout India typically are the harbingers of color; however, in Amritsar, the men are just as much a part of the vibrant color display as the women. In my experience, men in all parts of the country wear solid color pants or traditional dhoti or lungi. Their shirts sometimes have patterns, but they’re softer tones than what women usually wear. The same is true in Amritsar for the pants and shirts that most men wear, but Sikh men also wear turbans, and these elaborate head wrappings are luscious with color. Yellow, pink, lavender, indigo, violet, bright red — you imagine the bright color, and it’s there. Because the color is on their heads, it punctuates all space differently than I’m used to, and I loved it. This is a tourist destination, so the crushes of people are wild with their turban and sari colors. The Golden Temple sits in the center of the old city. The surrounding streets are a surprising display of urban planning: updated store fronts, pedestrian malls, and tourist trinkets geared toward the 100,000 visitors the Golden Temple hosts each day. This temple is revered because it contains the holy scriptures for Sikhism. There are many here who come everyday, as well as those who travel from very far afield to worship in this space. The temple is as organized as any tourist destination I’ve seen, and It’s staggering to think of how many people visit here. One man told me 10 million visitors come to the Golden Temple a year. The Hindustan Times reported that more people visit the Golden Temple than the Taj Mahal each year. The daily total is roughly double number of visitors than Disneyland in Anaheim, California hosts in a single day. This happens every day. The temple complex has an outer entrance area and an inner sanctuary. The inner sanctuary is a simple courtyard design and large in scale: the temple, covered in actual gold, sits in a large “water tank” — a ceremonial pool that’s larger than an a American football field. A wide walkway runs the perimeter of the tank thus creating the courtyard feel, and every surface that isn’t gold or water is white marble. Visitors — pilgrims and tourists alike, leave their shoes outside, cover their heads, and silently circumnavigate the tank and temple. There are men and women who do ritual bathing on one side of the pool — this is a holy site afterall. Others sit along the walkway, saying prayers or sleeping depending of the time of day. Gentle kirtan music is performed by musicians who are sitting inside the Golden Temple; stadium concert sized speakers in the corners of the courtyard amplify the gentle harmonium, tabla drums, and melodic chanting. Usually the rule in India is loud is great. Here, the music volume is just soft enough to make you feel like the music is only in your head. Our first visit was for sunrise, which came around 5:30am. We found that many devotees had arrived nearly two hours before (hence the sleeping by some) for the opening prayers when the Holy Book is put on display. We found a small piece of marble to sit down and watched for over an hour as people, nearly all Sikhs, wandered by us. Some were alone, most were with family or friends. Again, the colors, even in the pre-dawn light, were vibrant: the white marble, the black water, the Golden Temple, and the pastels of the turbans and saris filled every direction. The kirtan music was just audible enough to push away any sounds of the soft talking. It felt like silence even with so much activity. The transition from dark to light was meditative as if it were designed by this place. Crowds swelled after sun-up, and we left for the day, returning again in the evening for the opposite transition, from sunlight to darkness. The hour we spent in the morning, and the other hour in the evening were among the most tranquil experiences I’ve had here. Amidst all the movement was just the right level of calm. There’s a famous food kitchen attached to the Golden Temple complex. It’s well known to some because it feeds all patrons the same meal — three different forms of dal and roti bread — for free. All people are welcome, and nearly all of the labor and service is provided by volunteers. Tens of thousands eat here each day (reports I’ve read vary from 30,000 to 100,000). When we went, we sat on the floor with everyone else in a large hall; I think there are seven more halls like this one where food is served. By my estimation, there might have been two thousand people sitting on the floor in our hall. Each person puts his or her metal tray on the floor in front of them, and servers come by with big buckets of the different types of dal. They ladle it out quickly to each person, and within minutes the whole room has been served. Sitting like this, everyone just the same, is a powerful communal experience, even if it lasts for 20 minutes. One of our friends brought her family here over a year ago and loved it because her two young boys were sitting at the same level as all the other children — literally they made eye contact with each other and in spite of language barriers, were afforded interactions that aren’t possible in other parts of life here. My experience was similar — lots of eye contact and not a lot of words. It’s a surprisingly intimate experience in a room with 2,000 people. The photos that you can take in Amritsar are fantastic — it’s hard to take a bad one. What isn’t captured, however, is that the beauty in Amritsar is more fully felt than seen. The contrasts of the gritty, grimy streets in the city and the sparkling marble and impossibly bright turbans, the glimmering temple are magical in real life, but get dulled in the camera. The music feels like a warm hug. Eating with thousands of others at the same time feels connected, calming, and unexpectedly still. A little less than three months ago, Susannah and I visited one of the hidden gems of India: the Ajanta and Ellora Caves. These are two different locations outside of the dusty city of Aurangabad, where Hindu, Buddhist, and Jain devotees carved dozens and dozens of temples into cliffs of solid rock. These man-made religious sanctuaries are centuries old, and are simply awesome. I first heard about these caves within a few months of moving here; I noticed that those who had been here talked about their experience with similar awe about their experience. They also in no way captured what it was like to actually be there for what you feel being there is far more profound that what can be imagined. Getting to Aurangabad from Chennai is logistically challenging, so we had to commit part of our spring break trip to make the flights work. I think because it can’t be easily visited in a weekend fewer people visiting India see the miracles carved into the side of the cliffs. There are two separate locations — Ajanta is one, Ellora is the other — each with a network of temples that stretch along separate rivers. For the geologists among us, the rock in both locations is solid basalt, which was formed during at least one massive volcanic eruption more than 70 million years ago. At Ajanta, a cliff was formed when a river wore it’s way between softer rock surfaces: the cave temples follow the river in a horseshoe contour that stretches out over close to a mile. Along this stretch, 30 caves are lined up next to each other. From the outside, the entrances are similar — they each have a large rectangular entrance along with massive rectilinear windows to allow in light. Inside each of these caves is sight of wonders. In Ajanta, the caves are all temples, carved into the solid rock, all honoring Buddha. The ceiling in many of them is more than 10 feet high, there are commanding pillars with different levels of ornamental carving, and a giant Buddha statue in what later architects would call the apse. In the first few, the walls are painted with murals of buddhas and bodhisatvas and lay people. There a several temples which are narrower, perhaps three times as tall and feature large stupas along with sitting buddha sculptures. One has a sleeping Buddha, similar in style although much shorter than the famous one in Bangkok. Stone columns have some remnants of painting, and in the tall ceilings, ribbed patterns on the ceiling look like wooden support beams — the looks are deceiving as all of this is stone. Construction on these cave temples began more than 2000 years ago. Some took hundreds of years to complete. The Ellora caves are nearby and follow a similar story — temples carved into basalt, construction began around the same time on the oldest temples although more recent ones were started only 1000 years ago. There are more than 100 caves in Ellora, spanning a greater range of sizes than Ajanta, and the caves fall into three categories — Buddhist, Hindu, and Jain. There are single-chamber caves, there are monasteries which have multiple floors with balcony windows, and there is one temple that was carved not from the side of the cliff, moving into the center of the rock, but rather construction was started at the top, and the carving went down into the basalt. This is Cave 16, Kailasha Temple to Shiva, which is renown for being a monolithic sculpture where 3 million cubic feet of rock were excavated in its construction. For me, I kept saying to myself, aloud: “negative space!” This single-rock-carved temple was built by making the negative space in this cliff visible. These temples are wondrous. They’re beautiful in their own right. Mystical, too. The story around the caves in both locations are hard to imagine — some of these temples took hundreds of years to complete, and then they were “lost” for centuries. In the 19th century a British man stumbled upon them while hunting tigers. The last known reference scholars can piece together about these caves comes from the Mughal empire. I remember being in the Valley of the Kings in Egypt, where the tomb for King Tut is, as well as the tombs for 61 other pharaohs. Those tombs are multi-chambered subterranean mausoleums, created to be hidden from grave robbers (it was unsuccessful — a community of bedouin homes nearby is commonly called the “valley of the thieves”). I was struck when I was there by the complex mapping of the underground construction — some of those caves had chambers that came very close to the chambers of the neighboring tombs. I wondered how the engineers knew how not to crash into the adjoining chambers. The caves at Ajanta and Ellora aren’t as close in proximity, nor are they underground, but there’s a similar vision and craftsmanship displayed in each location that is worthy of our awe. I wondered here how the designers of these temples decided when to stop building one temple, and when to start on another. I wonder why they chose so many that are both different from each other and yet were quite similar. We often think of the people in the ancient world as just struggling to survive the elements or hostile neighbors, but places like this weren’t built to survive a bad storm or invasion. These miraculous caves should remind us of the indubitable human desire for artistic articulation and expression of faith. It’s been 58 months since I moved to India. I visited the Taj Mahal for the first time two weeks ago. All this time, I was waiting for the right opportunity to visit. I noticed among the small expat circle to which I’m connected that those who do not see themselves living in India for very long tend to go to the Taj Mahal not long after moving here. There are others who wait until a special occasion, like when a loved one comes to visit, to make the trek there from Chennai. I had plans to visit with distinguished guests, but there’s a lot to see in India, and it just never came together until now. I had actually begun to wonder if it would ever happen — there were always other places to go. As a way of justifying not having been yet, I said to myself that it’s a lot schlepping to see a single building. Two of Susannah’s dear friends from way back planned a trip to see us and to travel to some other parts of the country, finishing with a rendezvous in Delhi and then together we’d move on to Agra. The Taj is one of those places that I had seen so often in photographs. I wondered if it could live up to the hype (a friend who has visited often even suggested the day before we left that I lower my expectations). The closer we got to the trip, I also had a surfacing memory of loss related to the Taj Mahal: a friend I’d known from high school was killed when she was in college as the bus she was riding in crashed on the road from Delhi to Agra. Those memories were in the background as we planned for and started off on our visit. The Taj Mahal website says that as many as 8 million people visit the site each year (with only 800,000 coming from overseas!). I also read that the number of daily visitors is capped at 40,000 — which is Disneyland-level numbers. There aren’t a lot of other reasons to visit Agra — it looks and feels like a relatively small town, even village, that as tens of thousands of people arriving and departing every day. In a country where extremes are the norm, Agra stands apart for its dichotomous daily routines. We lucked out in our planning as it enabled us to enter the grounds just after sunrise. It was cool, fewer people were there, and the light slowly shifted over the time we were there. The area around the grounds and mausuleom are designed so that the Taj is not visible until you get right up to it. Most people see it for the first time as they walk through a wide door in a tall gate — the antechamber entrance is dark; gradually the people in front of you filter forward and suddenly the source of the brightness coming at you is the light gleaming off of the white dome, towers, and walls of the Taj straight ahead of you. It’s a fun first impression. I think I walked around the grounds with my mouth open with wonder for the first half an hour after arriving. The photos over the years — and how many have I seen of the Taj Mahal, hundreds, perhaps? — don’t do the place justice. Those images felt like they were as accurate as the shadows on the wall in Plato’s Cave. Once I could speak again, I think I said more than once that I couldn’t believe what I was looking at. Everyone around me was taking photos, which was no surprise. Thinking about it now, I wonder how many photos get taken there each day — could it be a million photos a day? That would only be 25 photos per person if 40,000 people actually visit in a day. Whatever the number, I can’t imagine that looking at all of those images taken on a single day would come close to capturing the experience of standing there. The story behind the Taj Mahal is well known. A Mughal ruler, Shah Jahal, commissioned and built this place as a mausoleum to honor his favorite wife, Mumtaz, who died in childbirth. The details of the backstory didn’t sink in for me until I saw it in person — this is a testament to the Shah’s grief. He’s buried here, too, but I wonder if he felt any significant relief from his loss once it was finished. I did not expect to make the connection to my friend’s death from 22 years ago, but I had many memories of her in the week before our visit here. I was surprised that I remembered the moments that reemerged; I was also aware that in spite of the time that had passed, those memories felt like no time had passed at all. I image that the Shah’s sadness could not have been dulled by this massive monument. I wonder if that’s what he wanted. When you enter the mausoleum itself, no photos are allowed. It’s dim and quiet, but not solemn as you make your way around the loop surrounding the faux-crypt inside (I read that the actual tombs to Mumtaz and the Shah rest below the area where tourists are permitted). As we circumnavigated inside, I found myself humming the tune of “Dear Prudence” — the Beatles’ song. Earlier this year, I read that John Lennon wrote this song at the transcendental meditation center in Rishikesh, India, as Prudence Farrow (Mia Farrow’s sister) was in the middle of a meditation session in her room that lasted two full days. I wondered, which is the greater honor — to have this magnificent building constructed in honor of your life, or to be the inspiration for a Beatles song? The end is nigh! The end of the school year, I mean. Students wrapped up on Thursday. Faculty checked out on Friday. Administrators complete their work on Saturday and Sunday. I’ll get on a plane in the early, early hours of the morning on Monday with a little hop in my step as I look forward to a much-needed summer holiday. Just like that, my four years in India have blown by. There’s a transitory quality to this life that is quite unlike the common teaching experience in North America. Teacher turnover in schools happens with much less frequency there than it does in the international teaching world. Tenure isn’t a thing here. Typically, a teacher signs a two-year contract, and after that is on as many one-year contracts as is mutually agreed upon by the teacher and the school. 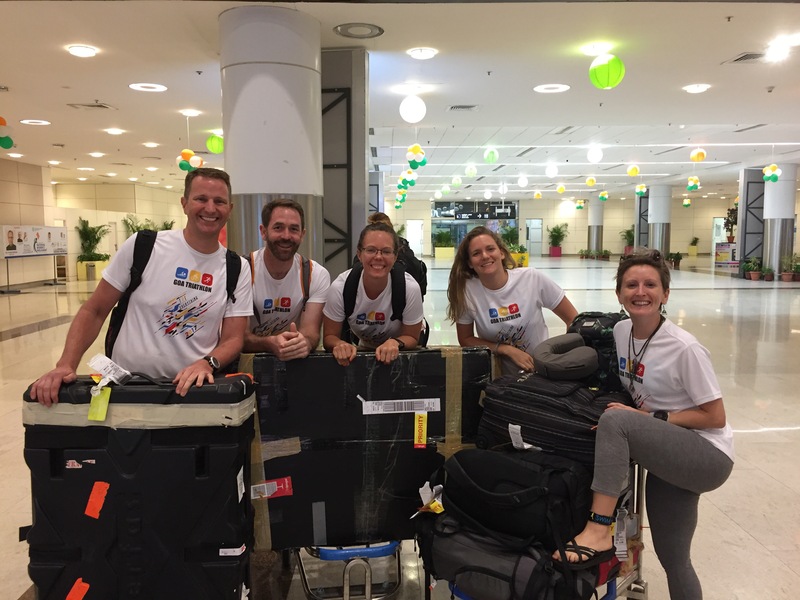 There are some international teachers who purposely choose to move every two years, and there are others who stay as long as they feel comfortable doing what they’re doing in that place. The average length of stay by teachers at my school is nearly five years — that number has gone up a lot in the time I’ve been here. I think there’s a sweet spot of the average number of years a faculty stays in place, although I don’t know what it is yet. If the a average is low, that says something — maybe that there’s too much disruption and instability; on the other hand, the average years of service could be too high — perhaps signifying that a faculty is too traditional or inhospitable to new educational methods. The end of the year brings with it some “have a great summer” moments, but also a lot of goodbyes. Typically a quarter of our students leave the school at the end of the year. Teachers leave too — not in the same proportions — and saying goodbye is tough. Even though Chennai is a huge population center, there’s a small-town quality to my school community. For most members of the faculty, the people we work with are also the people with whom we socialize and turn to for support. Bonds are formed quickly in this way, so when someone leaves, it’s not just like you’re losing a colleague. Your friends are going, and the departure brings with it a magnified loss. So, cleaning up your classroom or your office happens at the same time you pack up your house or apartment. Emotions are everywhere. One of the things I have come to appreciate is that the consistent turnover that is the nature of international education brings with it frequent validations and affirmations. I have noticed that people tell each other what they appreciate about one another more often than in other places I worked. This is not to say that I didn’t feel valued by my colleagues at my old school, but rather that I see many more instances of teachers (and students) communicating the impact that a departing colleague or friend has had than I witnessed or felt in my working life in the U.S. I appreciate that the frequent departures spark frequent conversations where one adult says to another “I appreciate you because . . . .” So, some sadness as I saw farewell to close friends, and also gratitude for the impetus to acknowledge these meaningful connections. 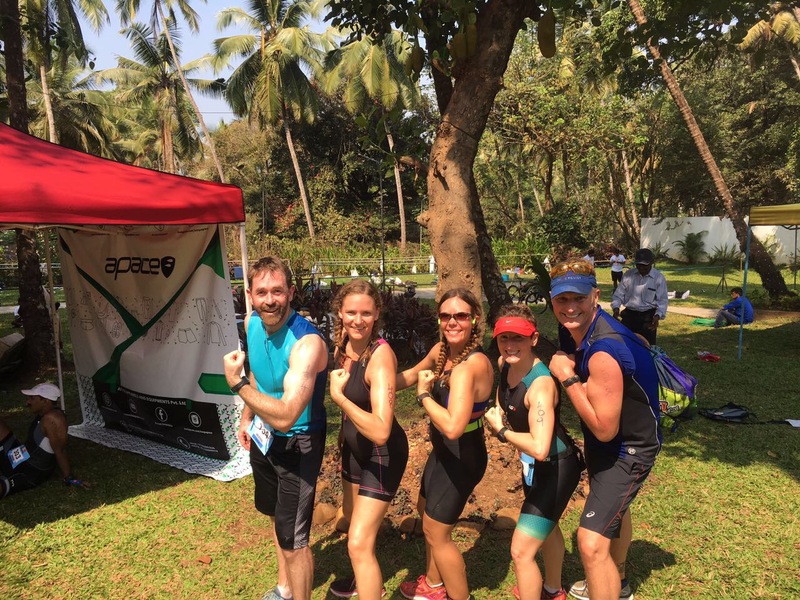 A few thoughts about my first triathlon. I’ve been wanting to do a tri for at least a decade. There aren’t that many things that I’ve yearned for and haven’t done, so the emotions of finally doing it snuck up on me. The whole weekend felt like I was one moment away from overflow. I had two goals: to enjoy the race while it was happening, and to finish injury free. I trained a lot, but on the morning of the race I was still shaking in my Lycra, not thinking I could do it. This feeling was accelerated by my own misjudgment of distance. There was a shorter tri that started just before the start to my race. As I stood at the water’s edge, looking out at the marker-boats, I said something to one of the four friends who did the race with me about how fast the swim would be for us. One of them looked at me and said, “You know the blue boats are for the Super Sprint, right? The red boats are for us.” I looked again. I saw the blue boats. Then I scanned the horizon for other shapes and colors. The red boats might as well have been in Africa for how far away they looked. I thought “I can’t do this,” and spent the next 20 minutes mentally wrestling with that one. Five minutes into the race, I was still psyched out. I even wondered if they would let me just do the bike and run portions for fun if I was DQ’d. Amidst this internal maelstrom, I noticed that when I breathed on my left side I could see the sun rising over the hills and trees beyond the shoreline. The orange and yellow ribbons spreading across the sky brought me back into myself. I remembered that I was supposed to enjoy it while it was happening, and here I had this great view of the sunrise from the water. So I kept swimming. I learned several valuable lessons in this process. One is that my body really likes the “brick” workouts — putting two phases of the race together in one workout. 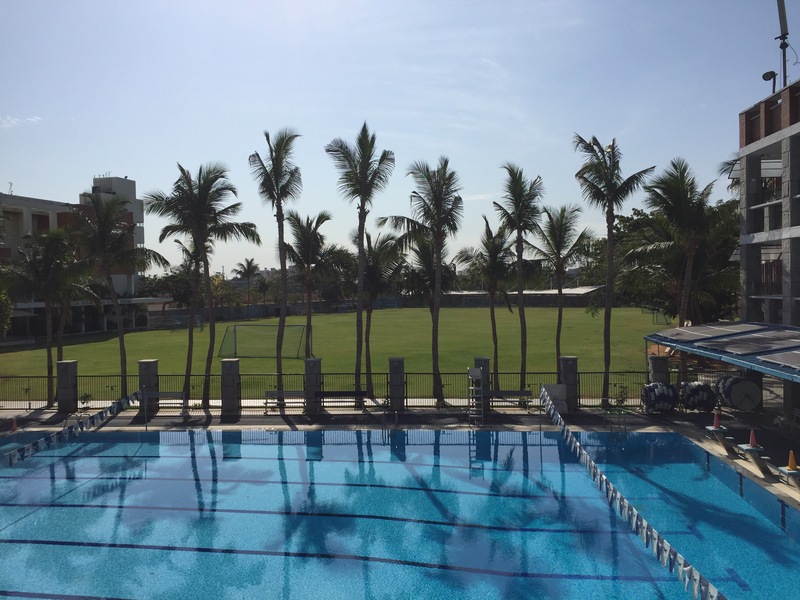 For example, following a swim with a run made me feel energized and alert like few other things I’ve done. I look forward to these invigorating workouts now. I also learned from one of my training friends, the mantra “no pain, no pain.” If it hurts, stop. Don’t be ridiculous. I don’t think I need to make that any clearer, but still, it was a revelation. My favorite lesson is perhaps that if you want to do a triathlon, you need to sign up for a triathlon. It took me more than a decade to put this one together. I cheered for lots of strangers while I was biking and running, and that felt good, which helped me enjoy the race while it was happening. There were also four other friends with me in the race, and each time we saw each other we traded inside jokes, rallying cries, and motivational aphorisms. I loved this part of the experience. I loved the absence of competitive acrimony that accompanies the team competitions that have been so familiar and detestable over the years. I’ve been around a lot of competitions at all levels, and the part I detest is the assholic behavior that often emerges during the quest to find that winning edge. During this race, competitive juices were flowing, but so was the mutual support among those in the race. As a first-timer, racing in a country that is not my own, I felt like I was part of the group. Overall, I’m proud of myself for doing this — the swim was daunting, and I worked on it. The heat was a challenge, and I dealt with it. The logistics of transportation, transition, and training were overwhelming at times, and I worked on a little at a time plus got help when I needed it. I met my goals and felt great along the way. I’m glad I tri-ed it.